Imagine your books are persons. Then arrange them according to the conversations they could have with their neighbors. Naturally, it captures my imagination to think of my books waiting until I flick off the lights to engage in their after dark chats. When I built my new bookcases and rearranged my home office, I spent hours one Sunday afternoon arranging many of my books in this way. I’ll be sharing some of my favorites over the next couple of days. 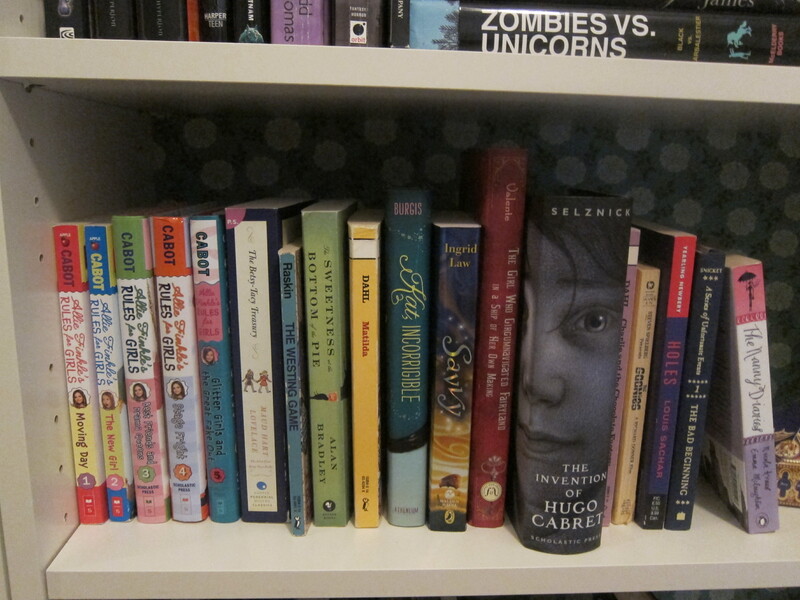 The books about precocious kids all got together for a wild rumpus on one of the lower shelves. Allie Finkle is pretending to be a foreign ninja warrior princess with Betsy and Tacy, while Turtle Wexler and Flavia de Luce start a girl’s detective agency. The kids from The Goonies (Yeah, I have the movie novelization. Jealous?) are joining up with Stanley Yelnats and the other delinquents from Holes to find a way to rescue the Lemony Snicket kids (“Orphans never say die! Down here, it’s our time!”), while Matilda and Kat Incorrigible sip tea and discuss Regency era romances and take turns moving things with their eyes to freak out the other kids. I thought about pairing Nanny from The Nanny Diaries with a cute single memoir guy, but I needed someone to wrangle the moppets at bedtime. I like to imagine this stack gathered around a flashlight at a sleepover when a storm is brewing outside. Catherine from Northanger and the nameless new Mrs de Winter from Rebecca could get themselves all in a dither with their tales of gothic fright. Then the ghostly narrator from The Lovely Bones could be like, “You guys are weak sauce. I have a better story about a creepy neighbor guy who built an underground cave.” And then Ms Roach, who would be surprised to find herself on my bookshelf in the dark, would roll her eyes and tell them that so-called “mediums” used to stuff gauze up their ladyparts to trick people into thinking they were spewing ectoplasm and, sorry Susie Salmon, but you probably don’t exist. But then Rory from Name of the Star would be like, “Uh, hey, I see dead people, so maybe they’re right.” And then thunder would boom through the room and they would all scream and jump. 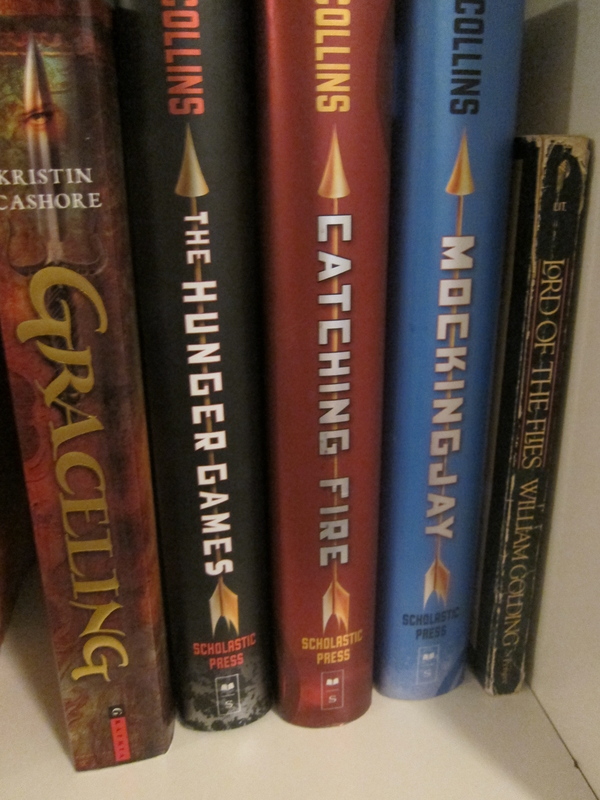 On this shelf, Katniss from The Hunger Games and Katsa from Graceling compete in a super intense archery contest complete with flinty stares while Peeta and Po sit to the side drinking beer and exchanging war stories. They’d kind of be hoping for a Girl Fight when the lost boys from Lord of the Flies would come over the hill screeching that they’re going to kill the pig, but they’d stop dead when Katniss and Katsa turn the power of their stone cold gazes on them. Peeta would say, “Hey, guys, have a beer or something. The girls will shoot us a pig for dinner later. Where’d you get that face paint? Do you have any left? That really takes me back.” And Po would say, “I sense these guys could use a bath.” They’d all have a good laugh, and then they’d discuss survival skills and form an alliance to take down the rest of the bookcase. Tomorrow: Mindy Kaling and Bridget Jones have lots of questions for Elizabeth Bennet-Darcy and a bunch of books take a road trip together. 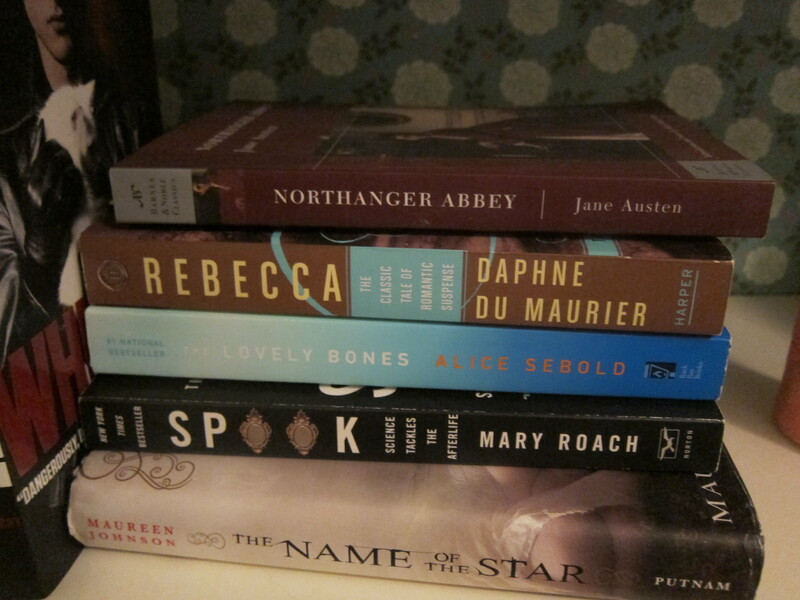 Posted on June 13, 2012, in Books and tagged adult fiction, alice sebold, allie finkle, betsy tacy, Books, daphne de maurier, ellen raskin, flavia de luce, graceling, holes, jane austen, kat incorrigible, kristin cashore, lemony snicket, lord of the flies, mary roach, matilda, maud hart lovelace, maureen johnson, meg cabot, middle grade fiction, name of the star, non fiction, northanger abbey, obsessive organization, rebecca, roald dahl, suzanne collins, the goonies, the hunger games, the lovely bones, the nanny diaires, the westing game, YA fiction. Bookmark the permalink. Leave a comment.